Hi everyone! 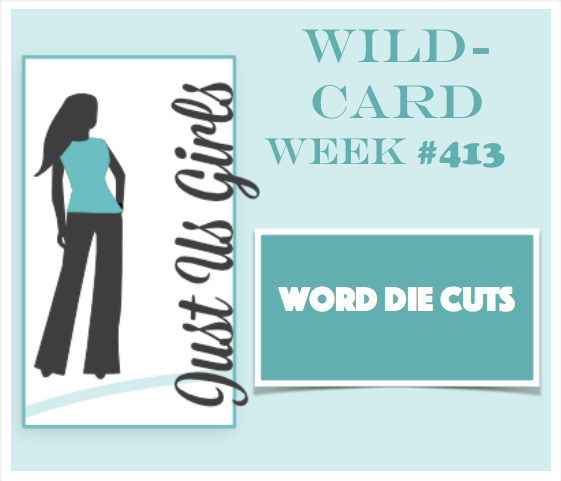 Today is the 5th Saturday in September, so Just Us Girls has it's Wild Card challenge. 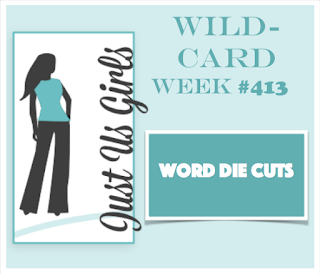 For this challenge, Nancy has chosen to use word die cuts on our cards. I have so many word dies, so it was difficult to decide which one to use! I settled on this one from Papertrey Ink. I first inked some Bristol paper with four Distress Oxide inks then die cut the word from it. I stamped the leaves in Memento Tuxedo Black ink and colored them with copic markers. 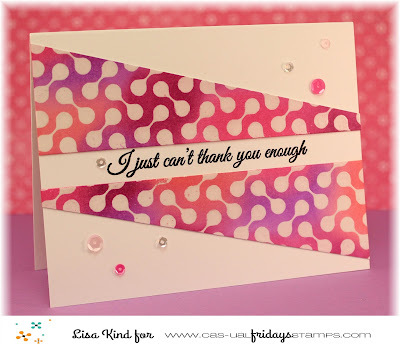 The sentiments were stamped next, and I added Nuvo Dew Drops randomly around the card. It's also spritzed with shimmer spray. This card is going to a colleague who lost her son this summer. I like it better than a sympathy card. 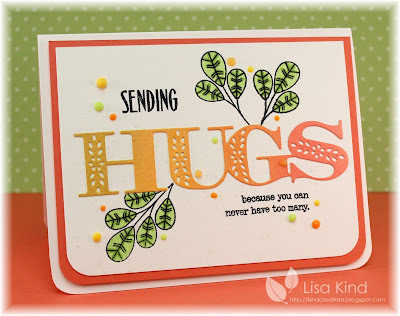 You can see more from the JUGs design team and our September guest, Linda, on the JUGs blog. This is her last week with us and I'd like to thank her for creating such beautiful cards with us this month. Hi friends! 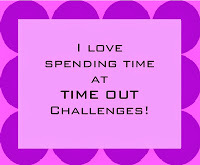 The new challenge over at the Time Out blog is a special one. 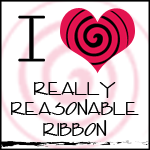 We are coming on the month of October and that means focusing on breast cancer awareness. So Time Out is doing just that. We'd like you to create something having to do with breast cancer or friendship and the twist is to use pink on your card. 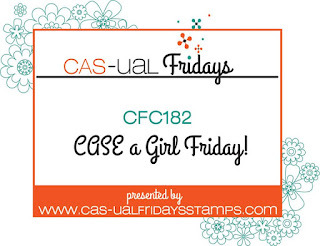 We are sponsored by CAS-ual Fridays, who has a few great stamps focusing on this topic. 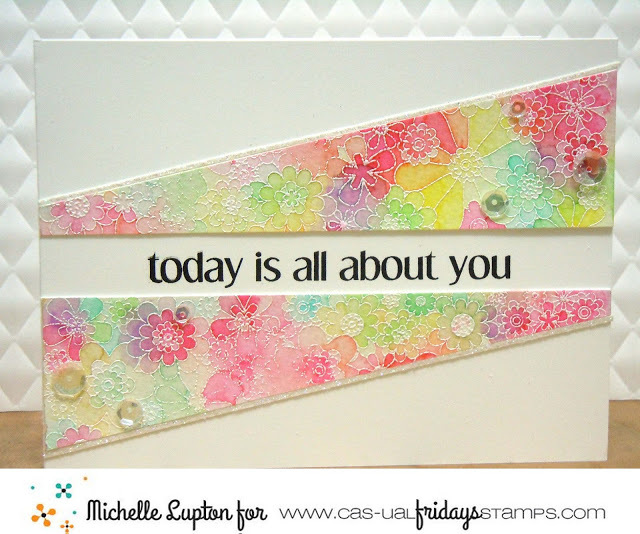 I'm using this set called "Be" by CAS-ual Fridays. 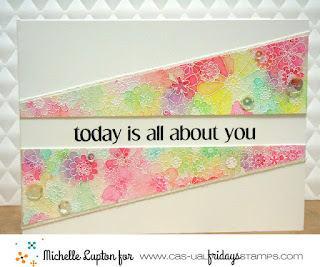 I love the sentiments in this set, and I chose to use all three on bands of pink ombre watercolors. 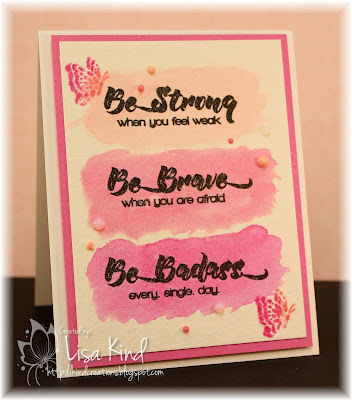 I used Distress inks for the bands and then stamped the sentiments on each one. The butterflies were inked with the Distress inks and stamped directly onto the panel. I spritzed the panel with shimmer spray, added Nuvo Dew Drops, and then adhered it to a pink mat. That was popped up on fun foam. 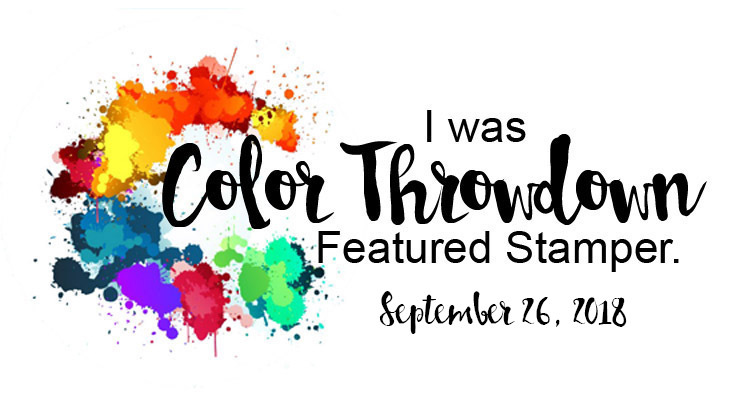 Stop by the Time Out blog to see the details of the challenge as well as the cards by the design team and our guest for this challenge, Yulia. I had two anniversaries to make cards for last week. One was for my in-laws who celebrated their 63rd anniversary, and the other was for our best friends. They celebrated their 40th! It doesn't seem possible that they could be married that long! Since the 40th is celebrated with red, that's what I went with for both cards. 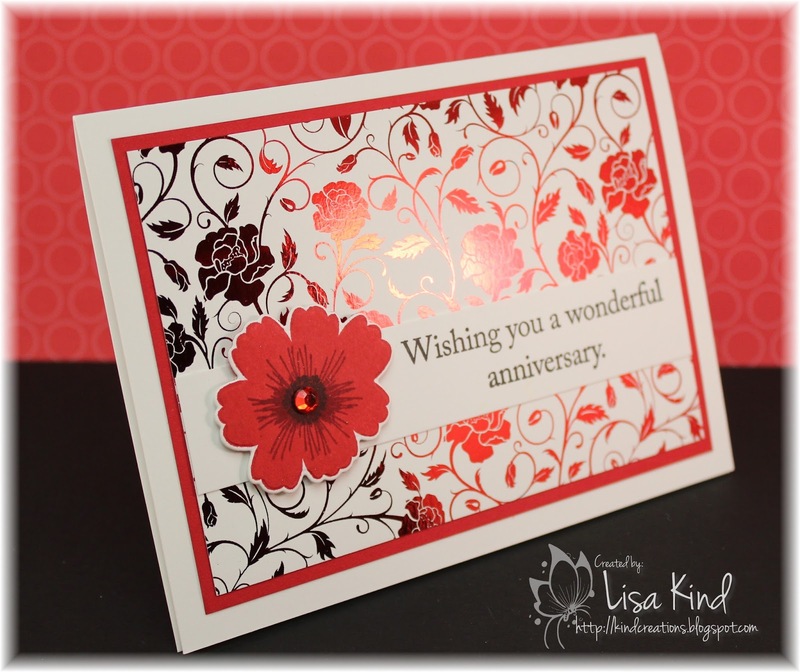 I started with foiling this foil mates panel from GinaK in red foil using my Mini Minc machine. 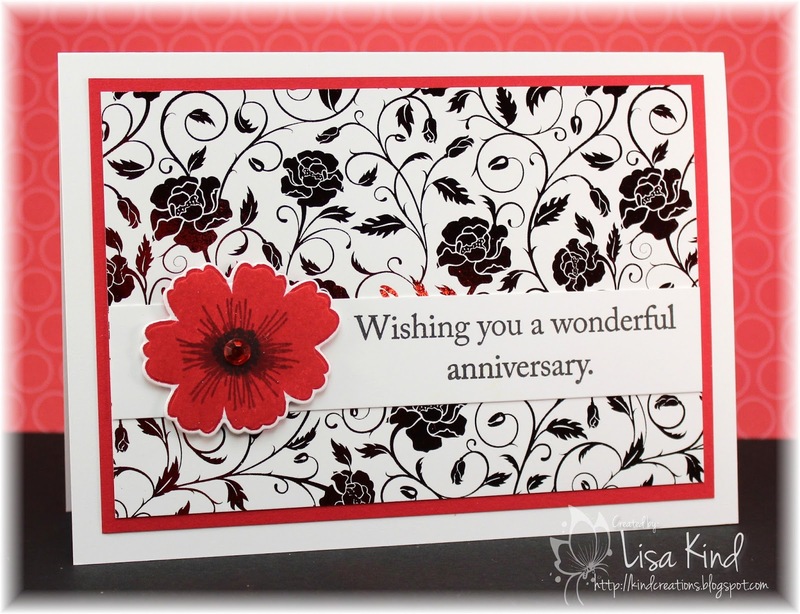 Then I stamped and die cut the flower and placed it on the white panel. The sentiment was stamped in black ink. A crystal in the middle of the flower finished it off. Simple and quick card. Here's a shot of the foil. It's hard to capture it in photos, but it was so pretty in real life. Hello everyone! 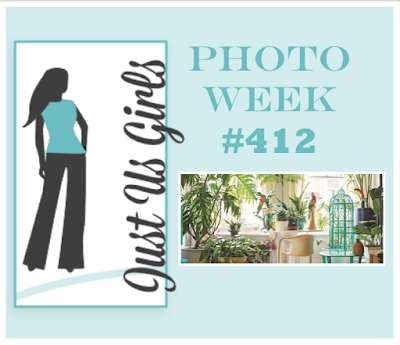 This week at Just Us Girls, Ina chose this great photo for our photo week challenge. Here's what I saw in the photo and how it translates into my card. 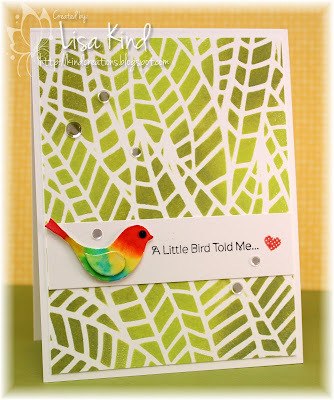 I chose this jungle stencil and used two Distress Oxide inks with it. While it was still wet, I covered it with clear embossing powder. It really intensified the colors. 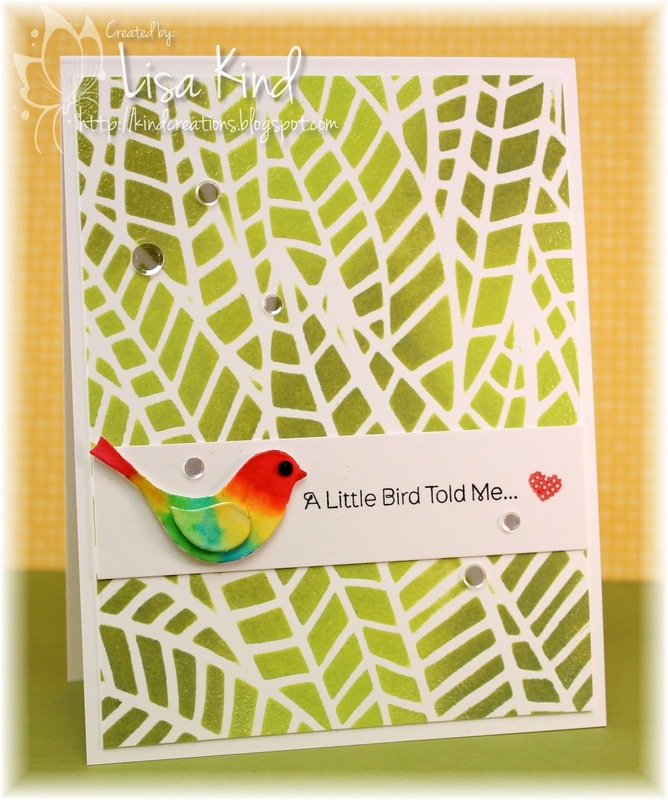 Then I die cut the bird and colored it with Zig markers to mimic the parrot in the photo. The bird is placed on a white border on which I stamped the sentiment, heart, and sequins. Hi friends! Today is color week over at Just Us Girls, and Maria has chosen a warm fall color palette. I just got this new stamp/die set from Concord and 9th. As I was thinking about what I was going to make, I picked up this set to take it down to my craft room and thought it would be perfect for this challenge. 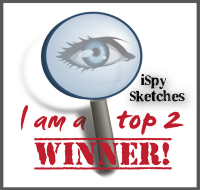 It's a two-step stamp, so I stamped the first layer in yellow and the second in orange. Then I stamped the berries in burgundy and die cut the wreath. Then I die cut the words and added crystal drops to the berries. The wreath was spritzed with shimmer spray. The front panel of the card base was given some texture with an impression plate. The wreath was popped up with dimensional tape. You can see more from our JUGs design team and September guest on the JUGs blog. Hi everyone! The challenge over at CAS-ual Fridays is to CASE a Girl Friday's card. Cool challenge! I chose this beautiful card by Michelle Lupton. I love her style and this one really caught my eye for a number of obvious reasons! 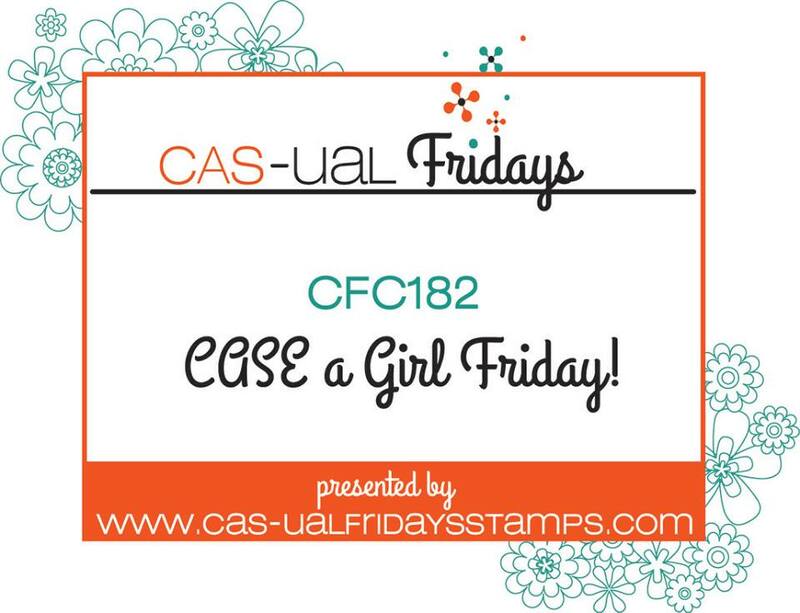 You can see more from the Girl Fridays on the CAS-ual Fridays blog. Hi friends! 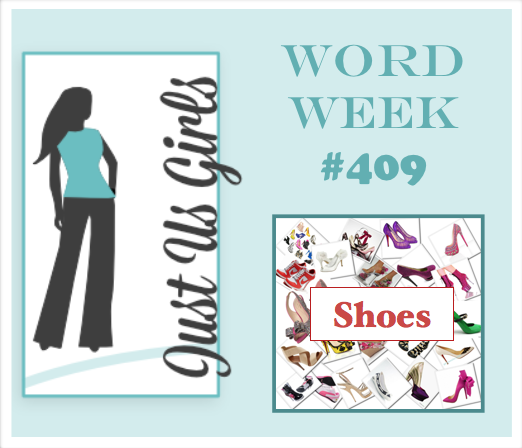 I'm the hostess over at Just Us Girls for our Word Week challenge. 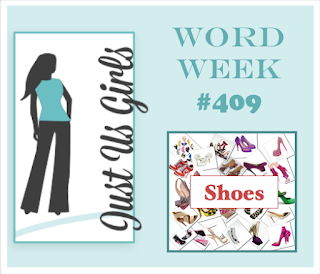 I chose the word "SHOES" as I've always loved them and have many! This is another new stamp I picked up last week at a Scrap and Stamp show especially for this challenge. It's from Technique Junkies and is one stamp. 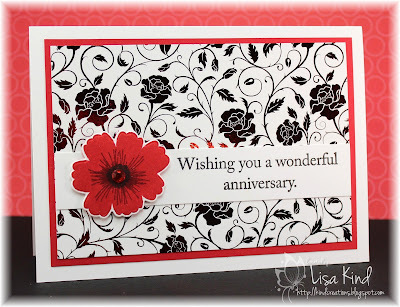 I stamped it in Versafine onyx black ink onto Bristol smooth white paper and embossed it in clear powder. It's colored with Zig markers. I had to color the soles of the shoes red! The straps of the shoes were covered with glossy accents and I added some Nuvo crystal drops. The panel was die cut with a wonky stitches die. You can see more from the JUGs design team and our September guest, Linda Snodgrass, on the JUGs blog. 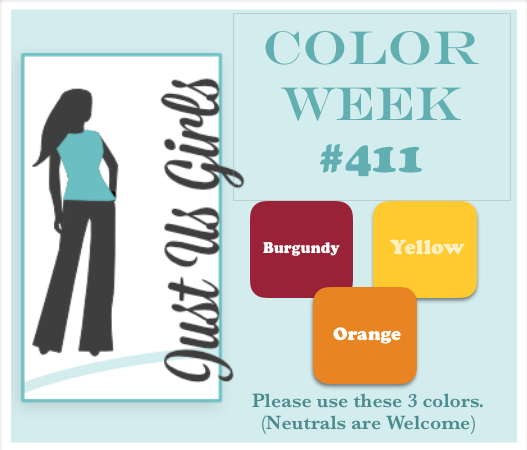 ETA: How could I forget The Daily Marker's Coloring Challenge? I'm entering my card!